Quilting Adventures: A balancing act....! As you know, school is finished for me. Convocation takes place early June. It will be nice to put a closure to that chapter in my life. Now, I begin a new Chapter, another dream come true for me. Stephen has been hard at work, building our furniture for the shoppe. Pictures do not do justice to the beauty of these fixtures! Our opening day is tomorrow, May 1! It will be a "soft opening" as we await the deliveries of future lines of fabric, filling our empty shelves. Tonight, I left the shoppe full of excitement, thinking about tomorrow. As I stood back and looked at my dream, I became overwhelmed with tears of joy. I am truly thankful! 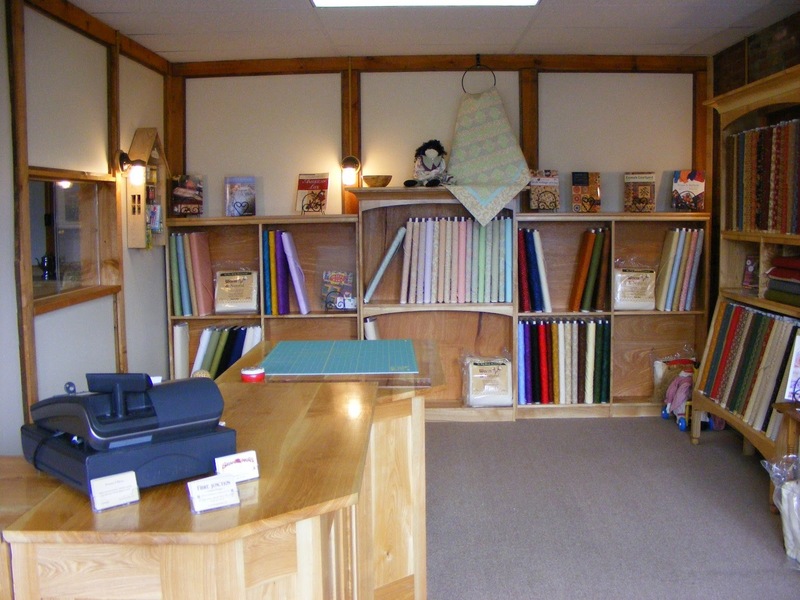 This blog will now also include my quilting adventures as owner of Fibre Junction. I want to thank you for being a part of my book of life, accompanying me on a new chapter. I have met some truly wonderful people. You have been an inspiration to me. Thank you for your support. Such an exciting time for you Carole! I wish you tons of success and of course have fun with it too! Can't wait to see your knew shop! Glad to see that you will have contemporary/modern fabrics....Good luck and best wishes! Congratulations...I remember so well the night before my opening day! Enjoy the day! Have tons of fun! Wow, what a great year for you, Carole! The fixtures in your store look wonderful in the pictures - can't imagine how great they would be in person! So happy for you - couldn't happen to a nicer lady. Congrats! Best wishes for great success with your shop, it look wonderful! The woodworking in itself is a work of art! I can't wait to read more about this part of your journey~ hugs for the road ahead! How very exciting! I wish you great success in the new adventure! CONGRATULATIONS. This is so great. OHMYGOSH!!! How Exciting! What a wonderful thing to do -- good luck with your dream!!! How exciting! I had no idea you were going to open a quilt shop. I've subscribed to the store's blog and look forward to watching your business grow. Congratulations, Carole! You must be so proud to have accomplished school AND opening a new business! I wish you all the best! I can imagine your tears of joy. What a wonderful dream come true! I remember my first day and it was so many mixed emotions. But alot of excitement. I hope you enjoyed today and it was a huge success. I'm sure it was. The cabinets look wonderful..
Wow...how exciting! I've just subscribed to your other blog...looking forward to seeing the progress and growth! Oh I am so excited for you! The shop looks great, I only wish I could come for a visit! Good luck in your new adventure! Congrats on your new endeavor! I'm waaay behind on blog reading, but with vacation this week, I'm trying to catch up. Congratulations on all your great news! Best wishes in your new adventure!